Carter Family Comics: Don't Forget This Blog! 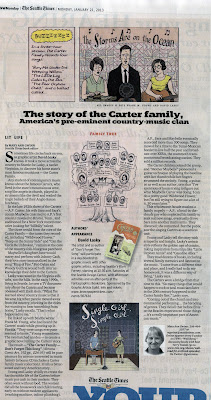 : The Seattle Times Covers The Carter Family Graphic Novel! On the RF Bestseller List! The Seattle Times Covers The Carter Family Graphic Novel! Since many of our friends, fans and followers can't lay hands on the print edition of The Seattle Times, here's a large scan I Frankensteined together for your reading enjoyment! The online version can be found HERE. Thanks to Mary Ann Gwinn for this very nice piece on our book! It's great to get some hometown coverage. As David and I have each lived in Seattle for over two decades, it certainly qualifies as our current hometown!